Author Kirsten IrvingPosted on October 4, 2018 October 4, 2018 Categories UncategorizedTags Bad Kid Catullus, national poetry day, poetryLeave a comment on National Poetry Day roundup: Catullus in the Guardian, Headbooks special offer and a cheeky Imp! Salve Citizens! 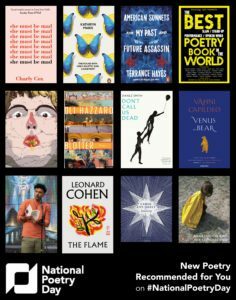 We are thrilled to announce that National Poetry Day, the biggest annual event in the UK poetry calendar, organised by the Forward Arts Foundation, has selected Bad Kid Catullus as one of its recommended poetry books! Look! He’s on the same list as Leonard Cohen! National Poetry Day is on 4th October 2018. Follow them on Twitter @PoetryDayUK and on Instagram @nationalpoetryday. Author Kirsten IrvingPosted on September 11, 2018 September 11, 2018 Categories UncategorizedTags Bad Kid Catullus, national poetry day, poetryLeave a comment on National Poetry Day recommends Bad Kid Catullus!